This American hero demonstrates the bravery and self sacrifice of America’s finest. While his very life is threatened, he saves lives as the flames consume everything around him. The calm spirit of compassion yet, resolute expression, emanates from his face as he ascertains the dangers that surround him. This piece has been featured on the NBC hit TV series called "Chicago Fire". One of the episodes that the piece can be prominently seen is in the episode entitled "A Rocket Blasting Off" that aired on March 11th of 2014. 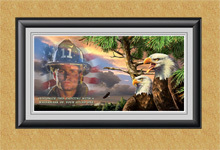 If you would like to order or find out the availability of the Fireman figurine or the high quality, mixed media print as an gift or as an award, please use the form below to submit your request along with your contact information. Field Items below marked with an * are required, others are not.